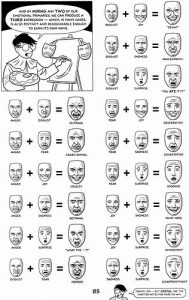 One common difficulty is to create characters with a wide range of emotions. Yes, your character may be chronically sad or mad; but if that note is hit over and over and over, it becomes boring. And unrealistic. I’m afraid I’m on the verge of doing this for my main character. I’ve got to go back and track the small shifts of emotion within a scene, as well as the overall tone set for each scene. One technique is to simply write the dominant emotion in the margins of the mss and track what you’ve done. The harder part is to build in those emotional changes in a book character. First, I’ll tackle the overall tone of the scene, lightening it up. This means small choices throughout, favoring more upbeat language throughout. It doesn’t mean I can’ use sad or mad as one of the emotions; it doesn’t mean that the character is overwhelmingly cheerful. It only means there needs to be a dominant tone of mad, but trying to get over it! And there needs to be lighter moments within the story. Hmmm… interesting pont, Darcy, and one that has set me thinking. How do we make sure the cahracter has a plausible emotional range? Perhaps by adding a little humour from time to time, or a scene where they’re indulging themselves a bit, or doing their job in a capable fashion – so that if they’re predominantly in a negative place mentally they are sometimes seen to be doing positive things. The same probably works vice versa as well – we don’t want predominantly happy characters to nauseate us all!